Please scroll down for the full product description. This portable, mini digital clock camera has been fitted with a hidden lens and recording system and so is perfect for covert surveillance around the home or workplace. The mini clock camera is very small, light and portable and it can run from the built in rechargeable battery for up to 6 hours from a full charge. Easy to set up & use.. The mini digital clock camera is very easy to set up and (full instructions and set up information in our guide above, just click the Instructions & Set Up Guide tab) can be controlled with the supplied remote control. Each recording mode can be started and stopped using the remote control. There is a small indicator light on the digital display, next to the time, which lets you know that the clock has “seen” your remote control push and activated or deactivated the chosen feature. You can choose to record continuous video or use the motion detection mode so that you only record when there is some action in front of the camera lens. There is also the option to set the mini clock camera to take a photo every 12 seconds if that feature suits your application. Furthermore there is also an audio only recording mode if that should be something you require at times. Infrared for night vision recording.. 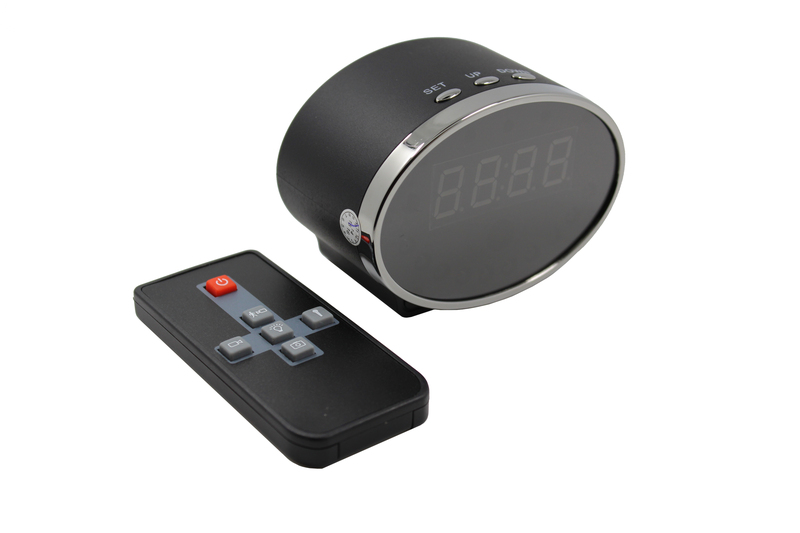 This covert clock camera system has built in infrared for night vision video recording, the infrared can be switched on/off from the remote control too. As with any video recording system, when you activate the infrared your recorded footage or images will be in black & white – the rest of the time the hidden clock camera will give you colour video and photos. Powering the mini clock camera system..
As mentioned above the Mini Digital Clock Camera has a built in, rechargeable, 3000mA battery. This battery can last, from a full charge, for up to 6 hours. The battery is charged via the supplied cable and UK 3 pin plug – a full charge can take around 4-5 hours. Alternatively, you could power and run the camera from the mains and then there is no restriction on running time. The clock camera requires a micro SD card to be able to record. Maximum supported is 32G. Not supplied. Please always use an SDHC, class 10 card. What size is the clock? You will see from the product images that the clock is oval shaped. The dimensions are 9 x 6.5 x 5 (cm) – so very small, travel clock size really. This is the standard version of the Mini Digital Clock Camera but if you would like to be able to view live footage on your mobile phone or tablet then please click here for the WiFi version. 1. Ensure that you have removed the protective transparent covering on the front of the clock and the battery protector inside the back cover of the clock. 2. Set the display time on the clock by using the SET, UP & DOWN buttons on the top of the clock. Push the SET button and the hour will start flashing, use the UP and DOWN buttons to select the correct hour and then push SET again. Now the minutes will start flashing, push the UP and/or DOWN buttons until you have the correct minute displaying. The push SET to finish. 3. Insert a micro SD card (the mini clock supports up to 32G, must be SDHC and class 10). Ensure you have formatted the micro SD card in your PC before inserting in the clock. The micro SD card slot is located behind the plastic cover on the back of the clock. The card will only insert properly one way so do not force it. The card inserts chip face up and will push in easily and click into place when inserted correctly. 4. You can now switch the camera/recorder part of the clock into the ON position (the on/off switch is the first one on the left when looking at the back of the clock. Here are the rest of the buttons running from left to right when looking at the back of the clock: Power, Motion Detection Recording, Continuous Video Recording, Photo Mode (will take a photo every 12 seconds), Audio Recording Mode. These buttons inside the back cover can be used if you want to set the camera to start or stop recording manually, alternatively and a much easier method, is to use the remote control to start and stop the various recording modes as well as switching the night vision (infrared leds) on/off. First ensure you have removed the battery terminal blocker from your remote. Then manually switch the camera/recorder into the ON position inside the back cover. When using the remote control you will need to point it at the front of the clock as this is where the sensor is. You will see a small blue light to the left of the time display on the clock when you push the power button on the remote control. A solid blue light denotes that the camera is in standby mode, if the blue light is blinking continuously this means that either you have not inserted a micro SD card or the card is full. If the camera is left in standby mode without a recording being started for about 20-30 seconds it will switch the camera off to save battery life. You can now choose the recording mode of your choice to start recording. When you push a button to start or stop one of the recording modes or features you will always get a reaction from the blue indicator light to the left of the time display on the clock. This gives you reassurance that your button push on the remote was successful. For example, switch the camera ON and push the power button on the remote – you will see the blue light and hear 3 short bleeps. If you then push the motion detection recording button the clock will give a quiet bleep and you will see the blue light blink 4 times, the light will then go out to denote that the camera is now in this recording mode. If you push the motion detection button again this will stop the camera from recording in this mode and you will hear a bleep and the blue light will show again to denote that the camera is back in standby mode. Continuous recording mode is the same as the above but just 3 blinks of the blue light when you start the recording. Take a photo every 12 seconds, same as the above but just 2 blinks. If you switch on the infrared for night vision the blue light will always blink just once whether you are in one of the recording modes or standby mode. Insert the card into your camera and switch the camera on. The camera system will now create a text file, named Setting, on the card. You can now remove the card from the camera and connect it to your PC using a card reader. Once you have connected the card to your PC, look for the “Setting” file and open it. You will see the various menu options (as detailed below). To change any of them just change the number to the right of the = sign. Once you have finished making any changes just save the file and insert the card back into the mini clock camera. Switch the camera OFF (using the on/off switch under the back cover) and connect to a mains power outlet using the cable and 3 pin plug supplied – this connects to the clock via the mini USB socket on the back of the clock. Whilst charging, the red light (next to the mini USB post) will show and this light will go out once the battery is fully charged. A full charge can take around 5-6 hours.